On a technical level, we’ve gone through patching existing code history and decided to create a whole new level: Our own code base with Icinga 2 and Icinga Web 2, our own features but also bugs. 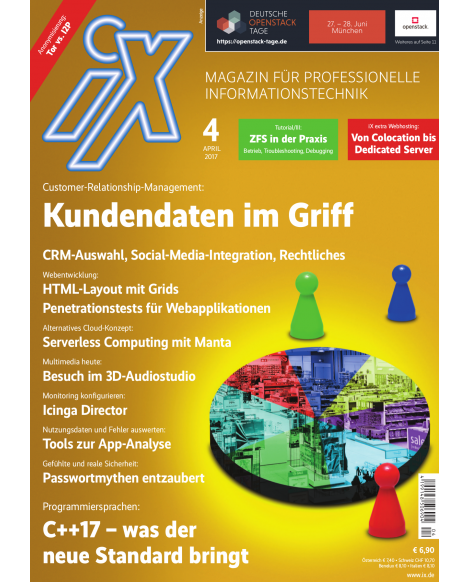 We’re leaving Icinga 1.x and the old code base behind these days. On a personal level we’ve focussed on team organisation and how to deal with community feedback. The important bits – be honest and friendly to encourage a welcoming atmosphere. Listen and spread the word. Work on the Icinga stack and enhance it by community and enterprise needs. We are designing monitoring architectures and combine our tools for enterprise and community environments. Integrations with existing tools is one of our key visions. There’s no way and time to reinvent things. We’ve also cut the straws and started to remove features which are broken, or their design and support bite us each day (deprecation of “bottom up” for example). Instead we focus on easy installation and automated deployments. We’ve joined the Chef partner cookbook program recently. Furthermore our Puppet module for Icinga 2 was approved by Puppet – #whoopwhoop. Lately we’ve seen a deep dive into Foreman, and also many Elastic Stack integrations. To mention – InfluxDB and Graphite are first class citizens too including fancy Grafana dashboards. Speaking of dashboards – Dashing is now an official integration. In terms of Icinga Web 2, you’ll recognise new releases of the Director, Business Process and Cube modules. It isn’t just about “installing monitoring”. You need to discuss your environment and figure out a way to integrate it into your infrastructure including volatile containers, cloud and more. That only works if you move from writing things to discussions and meetings. Our Icinga Camps are an integral part of bringing our community together. Last year we visited Berlin, Amsterdam, Belgrade, Stockholm, San Diego and San Francisco. While we love to tell you about new exciting things, we also love to hear your feedback. Or just discuss new features or implementation details accompanied in a relaxed atmosphere with a drink or two. Our first Icinga Camp in India happens this week: Icinga Camp Bangalore. Would you have believed that in May 2009? We are also visiting Amsterdam again where we made new friends last year at DevOpsDays. Monitoring is an integral part of the DevOps culture and you can learn a lot about current problems and future visions. You’ll also dive into different communities and bring them together. 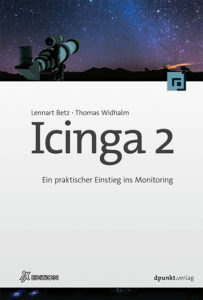 Icinga is recognised as monitoring tool all over the world, your weapon of choice preventing unwanted failures. We’ve left the discussion on “How do you compare to monitoring tool X?”. Instead you can try the online demo, or test the Vagrant boxes with various integrations. And if not, hop onto the community channels and kindly ask for help. I’m really happy that our privately maintained monitoring-portal.org platform has so many international Icinga users who help each other. 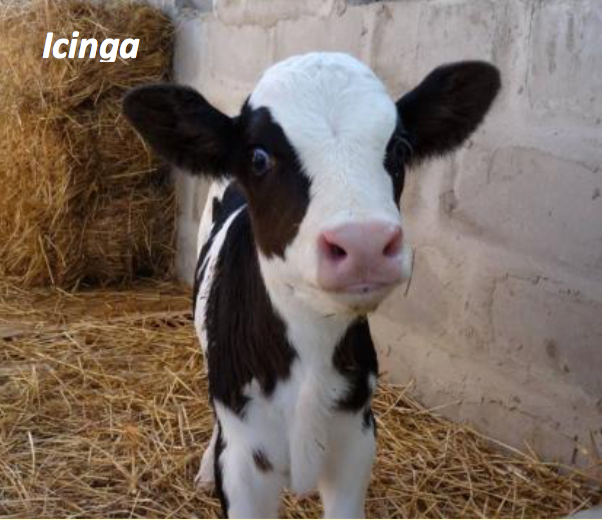 Social media and especially twitter proves how many people love Icinga. Our twitter account attracts more than 4700 followers these days. 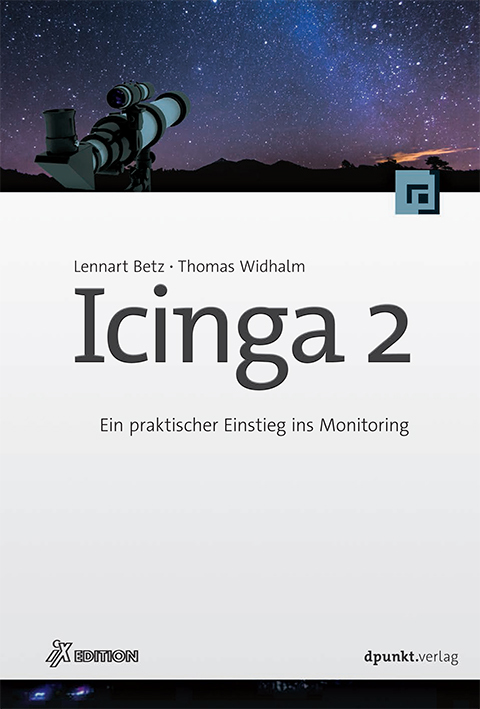 Reading docs, the new Icinga 2 book or meeting at an Icinga event might not be enough. Trying things without a design or implementation idea also is hard. This probably is the time to look for professional support providers. We are really happy to welcome more official Icinga partners! 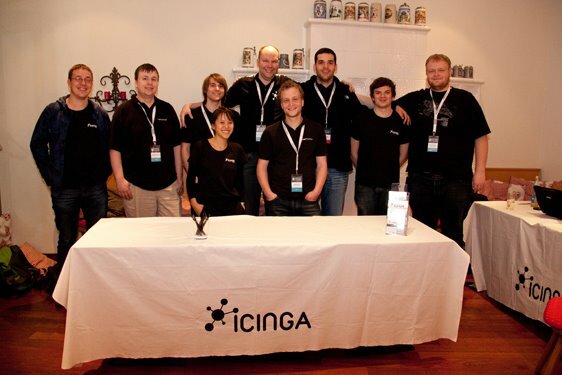 They can help with all sorts of Icinga “problems” – consulting in your area, support or even the official Icinga training. Support options also include bug fixes provided by the Icinga project, just ask our friends at ShadowSoft 😉 In the end, we all do monitoring for a living. 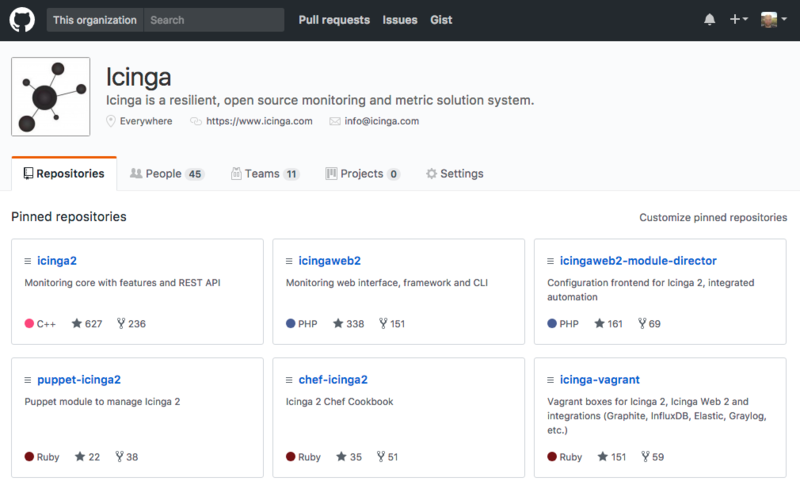 Features and bug fixes might need sponsors and help the Icinga project to evolve even more. Our partners also have come up with additional solutions based on Icinga: Icinga as a Service at NWS by NETWAYS, OpsTheather developed by OlinData or BigPanda with enhanced alerting. Encouraging everyone to send in feature requests, bug reports and patches in a friendly manner drives Icinga as an open source project. This can only be established if the underlying tool platforms works for everyone, developers and users. We weren’t happy with the old git and Redmine platform and decided to move to GitHub. This includes migration of the old issue history and URL redirects to ensure working with issues still is a joy. We are in a learning-to-use phase now and have started to enhance contribution guidelines and issue templates. This helps everyone joining the community. There are so many things going on. Developers add features, ask for tests. Users create their own Icinga Web 2 modules and plugins, and share them on social media. How to combine cool new things with positive and encouraging karma? We’ve come up with our “monthly snap” blog post series to highlight exactly that. We’re working on a new howto and docs platform making it easier to add and link cool stuff. You’ll also notice that Carsten’s Grafana module for Icinga Web 2 is prominently highlighted on our website. Sometimes it is also good to lean back and look what your community achieves. Simplest example – a user solved his/her problem and is just happy. Or you’ll peek into social media and find out that Marianne wrote an article in the iX magazine about the Icinga Director. She’s also well known for her blog sharing tips and tricks, like Christian who’s really into developing things. Bodo keeps pushing his Docker containers while Carsten takes care about the Grafana and Globe module for Icinga Web 2. There’s so many more users, thank you for making Icinga great! Create a vision and motivation. 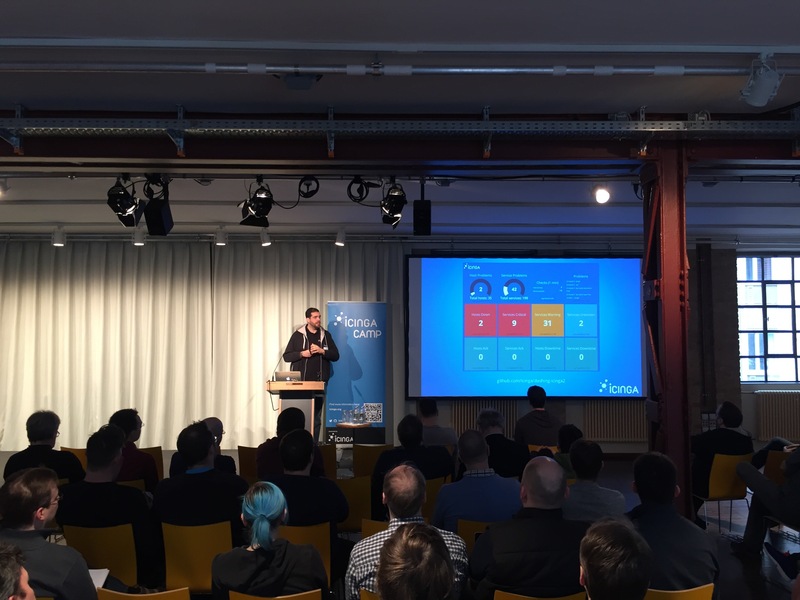 You’ve probably watched Eric’s talk on creating Icinga Web 2 modules. We want to make sure that the first steps into enhancing and integrating Icinga become even more easy. This includes more docs and howtos. Another idea of many – focus on stability and performance, and cut the IDO straw by introducing a new backend for core and web. There’s still work underway for the final design and implementation, more updates soon. Icinga Exchange will get updates soon to better highlight your plugins and modules. Well, and even more integrations to come, just like the Icinga output for Logstash. Thanks for overwhelming eight years. We’re looking forward to what happens next 🙂 See you at an Icinga Camp near you! PS: Call for Paper for OSMC is already open.